The best step-by-step guide for anyone learning to dance, or who has ever wanted to try! This DVD gives you everything you need to become a confident dance partner at any social function. 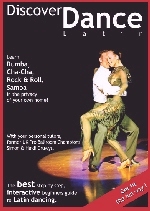 Just follow in the steps of former UK Pro Ballroom Champions, Simon and Heidi Cruwys, your personal tutors guiding you through the Rumba, Cha-cha, Rock'n'roll and Samba. Simon and Heidi also explain fully how to use the DVD and guide you through the menu. After each step-by-step lesson, a combination routine shows you how to put all the steps together, and there are also additional music tracks to give you extra entertainment and practice. The DVD technology allows a truly interactive learning experience. You can loop dance routines, practice steps, automatically view an on-screen counter to help with timing and rhythm, and choose either the Gentlemen, Lady or Couple role. Simon and Heidi also offer helpful advice and tips for beginners including warming up, leading, following, holding, how to avoid common mistakes, where to get the right clothes and where to look for venues to show off your new skills. Who knows where this may lead?! To give you a flavour of the passion of Ballroom dancing we have included a free professional performance by Simon and Heidi, as well as a sequence of more advanced steps to be taught in the forthcoming DVDs in the Discover Dance series. Special features include: Gentleman, Lady, Couple role option - Interactive menu - On-screen counting - Repeat function for practice steps and dance routines - Tips and advice - Additional music tracks - Professional show - Bonus routines from the next Discover Dance DVD.